Tikira is 97 years old and still an active farmer. He used to come to the Community Friends health clinic with his friends. He would always greet our volunteer group and visit for a few minutes. Sometimes he would join us for a tea. He brings his friends to the clinic who need medical attention. I think he is doing a great service to his community. Although Tikira didn’t come to the clinic for medicine, Dr. Ajith used to check his health condition and so far we have not given him any medicine. However, Dr. Ajith suggested that Tikira use eyeglasses, but we were careful not to push him too much. We asked what the secret is behind his sound health. He said, “I love gardening, I work every day in the garden, gardening vegetables, and after that I have a very good shower and I am very happy with my work and my life”. His work and happiness have certainly given him good health and a good life in Waitalawa. Tikira doesn’t have a complicated or stressful life. He works in the garden, eats what he grows and has a good sleep. This seems to be his secret to a long life. Latha’s baby girl, named Dasuni, is now 2 months old and happy at home. Her grandmother has been complaining about a rash on her skin but Dr. Ajith and Dr. Shalika said it’s nothing to worry about and it’s normal for new born babies. Latha has not recovered from the fear on the day Dasuni was born. According to our doctors, baby Dasuni is quite healthy but still it’s too early to say whether she will have a full recovery from the Hypoxia (lack of oxygen to the brain) during birth. We need to monitor the baby’s growth and development. Our doctors will continue to monitor the baby closely. After several days in the hospital, we drove Latha and her new daughter home for the first time. Her husband and parents were waiting to see the new family member for the first time. Both mother and daughter are doing well and we will post more news soon. The last several days at the hospital have been an exhausting experience for everyone involved, including Community Friends’ volunteers. Since Latha’s family was unable to make the journey to the hospital in the city, Community Friends’ volunteers and doctors have been providing around the clock care. The news about Latha is not good. She was admitted to the hospital January 4th in labor. Our volunteer clinic doctor, Dr. Ajith, and our directors arrived at around 10.00 p.m. Latha’s husband & parents were unable to make the trip from Waitalawa village to the city. In the second stage of delivery, the umbilical cord was wrapped around the baby’s neck making normal delivery impossible. Doctors performed a surgical delivery. Due to the delay, the baby was in fetal distress. The baby girl is now in an incubator in the hospital’s special infant care unit. We checked on both mother and baby today but the condition is not stable yet. Community Friends’ health clinic in Waitalawa, Sri Lanka, is in a remote mountain village situated in one of the best high-elevation tea plantation regions. Before we started offering monthly free clinics at the village, people had to walk nearly 10 kilometers to even reach a bus or three-wheeler to then take them to a local doctor. Our monthly clinics provide onsite health care led by our volunteer, Dr. Ajith, and other volunteer medical staff. 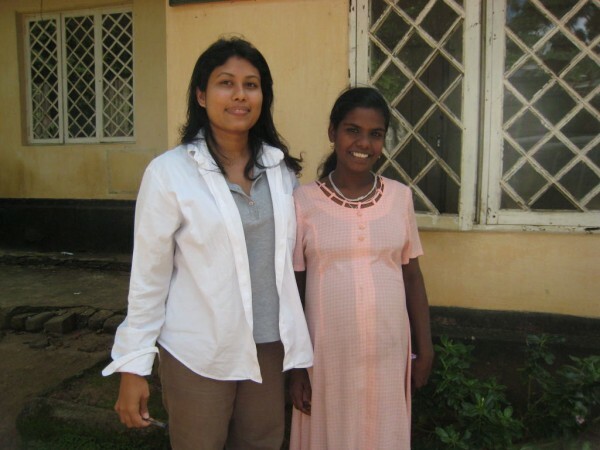 Last year, Latha, a newly married 22-year old woman came to our clinic. She lives with her parents and husband. Her husband works as a farmer in a small village far away from Waitalawa. After Latha’s marriage, her parents and husband wanted her to have a child immediately. Although she loves children, Latha explained that she was not emotionally ready. Her parents asked us to talk to their daughter about the situation. Seevali, one of our directors, along with our female doctor talked with Latha a couple of times and learned that she is afraid of becoming pregnant. We suggested therapy and our doctors began working with her. After only one month of therapy, we were surprised to hear that she was pregnant. She had decided to have a child without telling the doctors. She said that she “must please her parents and husband.” Her morning sickness became a serious illness compounded by her fear of pregnancy. Latha experienced continuous vomiting, no food intake at all, dehydration, and fainting until she suddenly collapsed. That night her mother called us for help. We went to the village and found Latha in very bad condition and immediately transported her to Kandy General Hospital about an hour’s drive from the village. Latha was admitted to the hospital and Dr. Ajith was alerted. Doctors at the hospital said that both Latha and her unborn baby were in critical danger. Everything happened so quickly even her husband, who was away in another village working, didn’t know anything about the illness until he came home. While Latha was hospitalized, Seevali stayed with her each day, feeding her and personally monitoring her condition with hospital staff to make certain she was getting enough medical attention. The public hospital system requires having someone serve as a patient’s medical advocate. 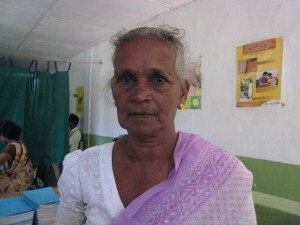 After three days in the hospital, Latha’s condition stabilized and she returned home to Waitalawa safely. 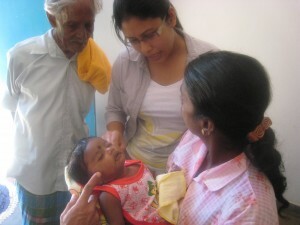 Latha is still coming to our monthly medical clinics and she is in good health now. Thanks to all Community Friends well-wishers and staff, we expect Latha will become a happy mother of a healthy child later this month. Today I visited with an older women in Waitalawa. Heenmanike is a 63-year old tea plantation worker living and working in the village since she was 21. She came to our clinic for high blood pressure treatment. She has been suffering from the illness for more than 6 years. She has been unable to take regular medicine from the government hospital in the nearest town because the travel is too much for her both physically and financially. The journey is more than a 10 km walk and a 4 km bus ride from her home. Another option is to hire a three wheeler taxi which is very costly for villagers who often live on very little. On the days when there is work, the rate is between $1.75 and $3.75 USD a day depending on international tea prices. During the past years she has not been able to take the medicine regularly. She started coming to our clinic in 2007 when the clinic started operating once a month. Our clinic doctors now attend to her with great care, monitoring her condition, giving her regular medicine, and treating the illness with personal care. Today the high blood pressure is under control and she is even going back to work on the tea plantations. She’s healthy and able to earn a salary again. I’m able to help out at the monthly clinics and I always make a point to talk to the patients like Heenmanike. I enjoy getting to know them better in case someone needs more support form Community Friends. And this is a great way to understand and monitor the living conditions of villagers in Waitalawa. 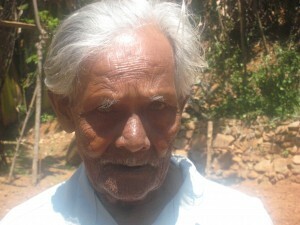 Since September 2007 volunteers from Community Friends have been visiting the village of Waitalawa in Sri Lanka’s upcountry highlands to hold a free health clinic for villagers. This community is made up of fourth generation tea estate workers, descendants of Tamil laborers originally brought to Sri Lanka by the English during colonial times. In fact, the community clinic facility is located in the plantation overseer’s former residence. Just like our school lunch program in Ulla, Sri Lanka, we observed that the conditions all around us spoke louder than our preconceived ideas about what we were there to do. Fortunately, Deva and Seevali, our Sri Lankan directors, have access to a large pool of interested volunteers. So we were fortunate enough to have three doctors contribute their time, equipment and broad experience in helping the tiny community in Waitalawa. During the day, our three doctors, Ajith, Tilina and Shalika (front left to right), along with Deva and Seevali (left to right rear) visited with over 80 villagers. For many of these villagers it was the first visit they had experienced with a doctor in decades. The utter lack of medical support in the region meant that people with ailments from far and wide came looking for help as soon as word made it out. Due to the volume of patients, we issued numbers to folks in the “waiting area”. As Community Friends grows, our hope is to meet the health-care needs of the community by offering more than one clinic per month. Clearly the demand is greater than our resources.